Hundreds of the last surviving D-Day veterans have gathered on both sides of the English Channel, 70 years on from the momentous World War Two mission. 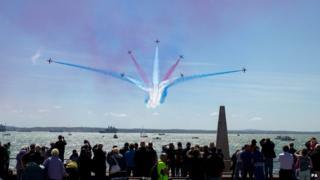 A spectacular Red Arrows display in Southsea and parachute drop in France came on the eve of the anniversary. The Princess Royal was at the drumhead ceremony in Portsmouth, where on 5 June 1944 troops were preparing to invade Nazi-occupied France. Between 2,500 and 4,000 Allied troops are thought to have died the next day. As many as 9,000 Germans are also estimated to have lost their lives when around 156,000 troops, mainly from Britain, the US and Canada landed on Normandy's beaches in one of World War Two's key turning points. On the anniversary of the eve of the landings, the Prince of Wales laid a wreath near the Pegasus Bridge - a strategic crossing which British troops captured within minutes of landing in gliders on the French coast just after midnight during the push. In a note written on the wreath he said: "In ever-grateful remembrance of your service and sacrifice, Charles." The prince and the Duchess of Cornwall had lunch with veterans and watched as more than 300 troops parachuted in to Ranville, the first village to be liberated. The Queen, who has arrived in Paris with the Duke of Edinburgh for a three-day state visit, will join other world leaders in Normandy on Friday to mark the day the mission began. Leaving flowers at the Tomb of the Unknown Soldier with President Francois Hollande, the two heads of state paused and bowed their heads beneath the Arc De Triomphe. About 650 UK veterans - most in their 80s or 90s and many making the journey for the last time - are expected at Friday's Sword beach ceremony. It is 70 years since D-Day, the biggest amphibious assault in military history. On the anniversary itself, the Queen will head an international service of commemoration attended by royals, presidents and prime ministers. Hundreds of veterans are here, but their numbers are dwindling. The youngest are well into their 80s. This will be the last significant anniversary most will witness. An emotional 88-year-old Sapper Harry Billinge said: "It was a killing field. I hope they will not forget the poor devils that died here." Navy veteran Charlie Stretch said D-Day was his last day as a teenager. "I was 20 the next day and I didn't think I'd see 20," he said. "In the navy you didn't get your tot [of rum] until you were 20 so I thought I'd go without having tasted rum." Fellow veteran Les Reeves said the commemorations were in honour of "the lads that never saw the White Cliffs [of Dover]" after crossing the Channel for the invasion. Dougle Morton, who was 23 on D-Day and landed on Sword Beach, said he was among a group of soldiers locked in a "prison camp" in Hastings before the invasion as Allied commanders tried to keep their plans secret. He said he remembered playing cards during the crossing and, asked what he felt about being part of such a massive operation, he said: "We had a job to do and we did it." Allied troops crossed the English Channel in the initial D-Day assault on 6 June 1944, paving the way for the defeat of Nazi Germany. The attack was planned from Southwick House, just north of Portsmouth, which was the main departure point for troops heading to Sword Beach. The city marked that history with a ceremony earlier. Many of those who made the crossing through the night were badly seasick. Some would never return. Today the weather was very different. In a message in the order of service, Princess Anne wrote that this year was "particularly poignant because it will be one of the last milestones on which there will be sizeable numbers of veterans who were there on the day". Prime Minister David Cameron said: "Shortly after D-Day, my own grandfather was wounded and came home. "We will never forget what they did and the debt that we owe them for the peace and the freedom that we enjoy on this continent." On the other side of the Channel, parachutists have landed on Sword Beach as part of the commemorations. And on Thursday evening, the Bournemouth Symphony Orchestra will pay tribute to the veterans. A flotilla led by HMS Bulwark is sailing from Portsmouth to Normandy with four vessels from other countries. Heads of state from 17 nations are to attend the international ceremony at Sword Beach on Friday, the easternmost of the five landing sites. The taking of Pegasus Bridge near to the French city of Caen by British paratroopers and glider-borne troops was a major triumph for the Allies in the early stages of D-Day. The Prince of Wales laid his wreath at the glider pilot memorial and attended a lunch with veterans, who will also attend the main international event on Friday. But the Normandy Veterans' Association says its numbers have fallen to around 600 from about 15,000 and has announced it will disband in November. On 6 June 1944, British, US and Canadian forces invaded the coast of northern France in Normandy. The landings were the first stage of Operation Overlord - the invasion of Nazi-occupied Europe - and were intended to bring World War Two to an end. Portsmouth's D-Day Museum says as many as 4,413 Allied troops died on the day of the invasion - more than previously thought. By the end of D-Day, the Allies had established a foothold in France. Within 11 months Nazi Germany was defeated. How close did D-Day come to failure?